1) To set up the SIP proxy, log into the Allworx System Administration Tool and go to Phone System > Outside Lines > SIP Proxies. 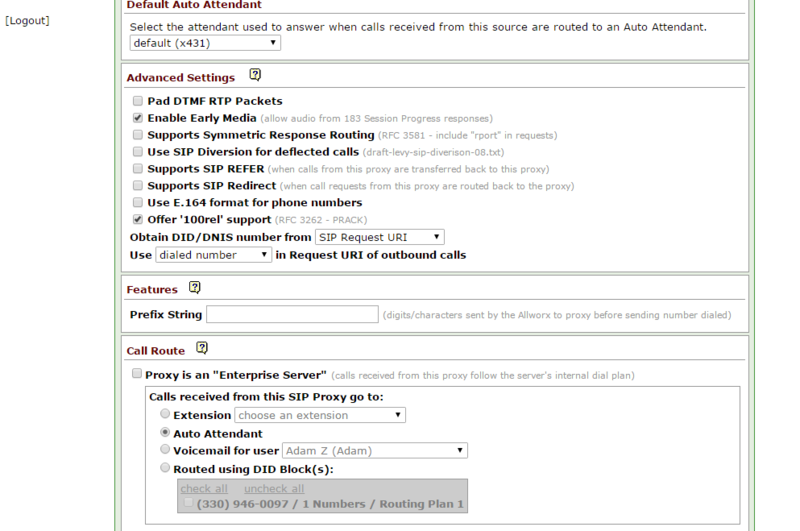 Select "Add New SIP Proxy"
2) After creating the SIP Proxy, the Outside Lines page will be displayed. There are additional settings to configure on the Modify screen. Select 'Modify SIP Proxy'. The Modify screen which now includes Advanced Settings is displayed. Create a new service group for SIPTRUNK.com or add it to a previously defined service group. To create a new one, select "Add new Service Group" near the bottom of the page. The New Service Group screen is displayed. Service Group: Put SIPTRUNK.com in the Service Group by choosing it and selecting "move->"
4) Once the Service Group is created, configure the dialing rules. Select 'add new DID block'. The DID block page is displayed.